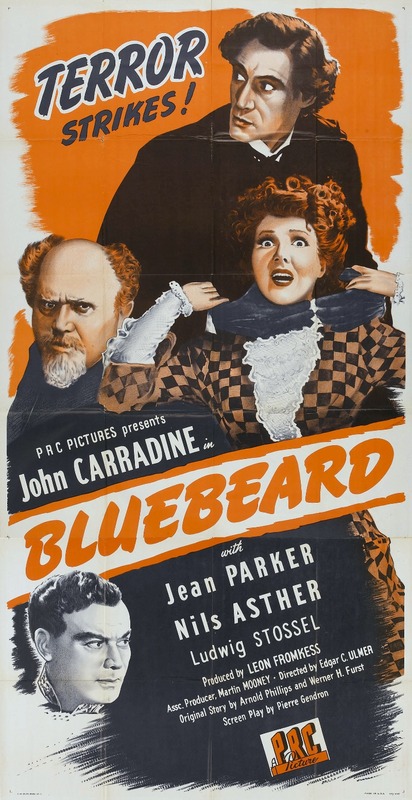 As a rash of murders occurs across Paris, an investigator (Nils Asther) interrogates an art dealer (Ludwig Stossel) who seems to have some connection to the case, and a puppeteer (John Carradine) becomes enamored with a costume designer (Jean Parker) who eventually realizes he is the murderer known as “Bluebeard”. 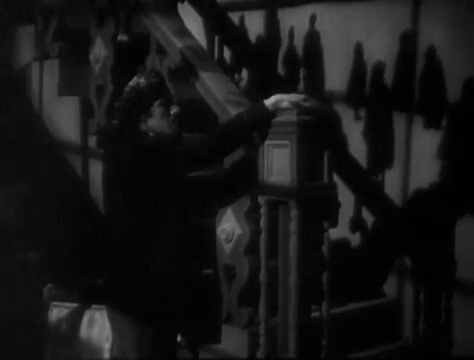 Peary is clearly a big fan of Edgar G. Ulmer’s low-budget PRC production (based on the enduring French folktale of Bluebeard), given that he refers to it as “a real sleeper”. He writes that the “Expressionistic” film — which has a “European look to it” — is “strikingly directed” and features a “great use of close-ups, shadows, and bizarre camera angles”. 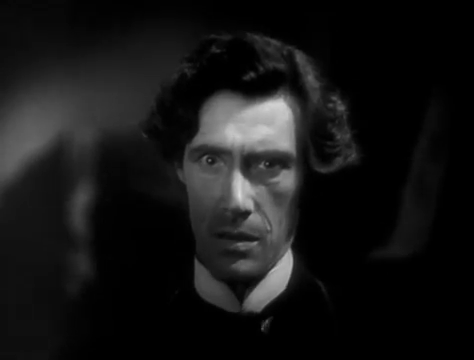 He notes that it provides John Carradine “his best lead performance and one of the few in which he doesn’t succumb to hamminess”; indeed, in his Alternate Oscars book Peary nominates Carradine as one of the Best Actors of the Year for this role. While I find the film visually impressive, I’m much less taken with its rather insipid storyline, which doesn’t reveal Bluebeard’s motivations until close to the end, and thus leaves us puzzled about why a seemingly likable puppeteer turns randomly into a murderer whenever he paints a beautiful woman. It’s nice to see Carradine given a leading role, and he’s suitably nuanced, but I much prefer him in his more memorable supporting roles — like Preacher Casy in The Grapes of Wrath (1940). Not must-see, and in overall agreement with the assessment. While I don’t find the storyline “insipid” necessarily, I do find it extremely rushed (at 70 minutes). It’s too compelling a story to see it given such facile treatment. Things happen too quickly, robbing the story of a beneficial build. I’m also a little bothered by Carradine’s big speech at the end. The reason he gives for his transformation into a serial killer seems slight, sudden and not all that believable. …Though I’ll agree with Peary that it’s nice seeing Carradine in a rare leading role, even if (again) the shortness of the film gets in the way of his character development. I was rather taken with Carradine’s co-star, Jean Parker. Although she was rather active on-screen in the ’30s and ’40s (including a few major credits like ‘Little Women’ and ‘Gabriel Over the White House’), it seems she then segued mostly into television. She has the look and personality of a Jean Arthur/Rita Hayworth hybrid.